Relativism about knowledge attributions is the view that a single occurrence of ‘S knows [does not know] that p’ may be true as assessed in one context and false as assessed in another context. It has been argued that relativism is equipped to accommodate all the data from speakers’ use of ‘know’ without recourse to an error theory. This is supposed to be relativism’s main advantage over contextualist and invariantist views. This paper argues that relativism does require the attribution of semantic blindness to speakers, viz. to account for sceptical paradoxes and epistemic closure puzzles. To that end, the notion of semantic blindness is clarified by distinguishing between content-blindness and index-blindness, and it is argued that the attribution of index-blindness required by the relativist account is implausible. Along the way, it is shown that error-theoretic objections from speakers’ inter-contextual judgments fail against relativism. 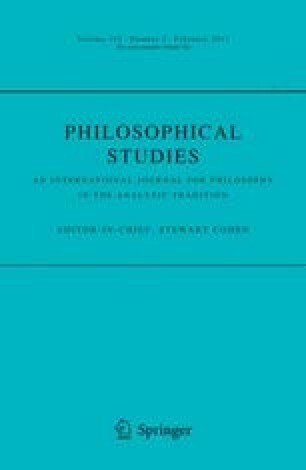 Earlier versions of this paper were presented in Edinburgh, Miami, St Andrews, at the Australasian Association of Philosophy Conference 2010 in Sydney, and at the conference ‘Contexts, Perspectives and Relative Truth’ in Bonn. I am greatly indebted to the audiences at all these occasions. Thanks to Derek Ball, Jochen Briesen, Jessica Brown, Herman Cappelen, Stewart Cohen, Torfinn Huvenes, Jonathan Ichikawa, Martin Montminy, Dilip Ninan, Jonathan Schaffer, Daniele Sgaravatti, Brian Weatherson, and all the members of Arché’s Contextualism & Relativism Project for their helpful comments and discussion. I am particularly grateful to Patrick Greenough and Jonathan Schaffer for their continuing support and their invaluable feedback on various drafts. In preparing this work, I have benefitted from support by the AHRC, the University of St Andrews, and the DAAD.